CBST and the Middle East and Me team invite you to this one-man performance exploring the difficulty of conversations about Israel in the American Jewish community. 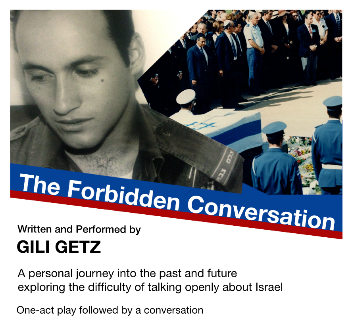 Gili Getz presents a deeply personal story of his relationship with his father and their conversations in Israel during the Gaza war in 2014. The performance is followed by an open discussion about the challenging conversations we have with family, friends and our community concerning the future of Israel, the American Jewish community and ways to process fundamental differences and disagreements. Share your love and pride, your disappointment and shame. All opinions are welcome. “The Forbidden Conversation" is appropriate for all people aged 13 and up, and for kids 10 and up who have already been introduced to conversations about Israelis and Palestinians. This event is offered free of charge, but please consider a donation to Social Justice at CBST to keep programs like this going!